SABC Digital News has won a silver award at the Bookmarks 2019 awards for its YouTube channel. Pitted against competitors such as Eyewitness News, TimesLIVE and News24, the award winning YouTube channel offers SABC News video content. The channel is one of the most viewed in South Africa. The accomplishment was further cemented at the Bookmark Award added to the prestigious silver award from YouTube itself for itself the subscriber numbers which currently stands at just over 500 000. The channel has had over 200 million views. The channel hosts the best of SABC television news where users can watch news clips, in-depth inserts, interviews, current affairs programmes and livestreams of breaking news and events (including full broadcasts of events not always available or fully covered on SABC television channels). 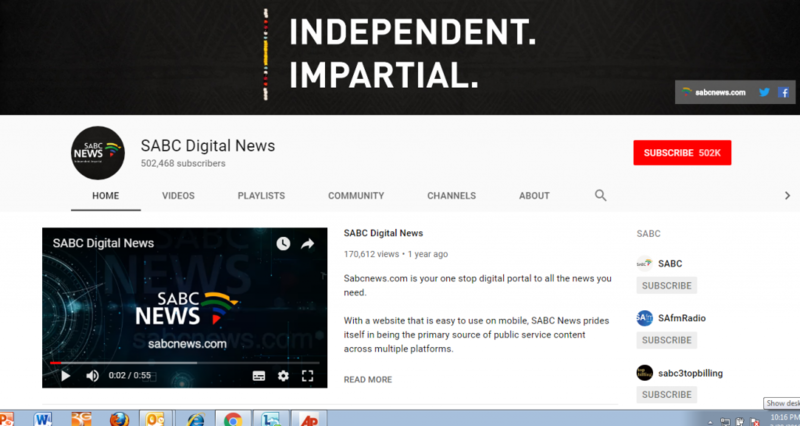 Videos are published in turn on the SABC News website and its social media accounts, providing a richer experience. The channel has also moved into the 360-degree broadcasting space – notably with the successful 360-degree and linear livestreams of the 16th Nelson Mandela Lecture delivered by Barack Obama in July last year. It was broadcast in collaboration with YouTube. The linear livestream of the lecture received 13 million views within the first 24 hours. The 360-degree livestream received just under 200 000 views on the day of the broadcast. The numbers for both videos continue to increase. The post SABC News YouTube channel wins silver at awards appeared first on SABC News – Breaking news, special reports, world, business, sport coverage of all South African current events. Africa's news leader..